The image that instantly comes to mind when most people think about controlling the sale is one that portrays manipulation and intimidation. I shudder when I think there are salespeople out there using selling techniques that dictate mistreating customers. What’s more, I can’t imagine anyone actually getting away with it. 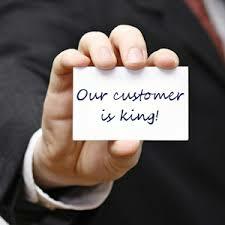 Customers should be cherished. However, I believe a salesperson must be able to control sales presentations, and if not, it is highly probable that problems will surface when it’s time to close. In fact, if a salesperson doesn’t take charge, I don’t think he or she can have a successful sales career. Like the caring teacher, I do everything I can to make it crystal clear that I have my customer’s best interests in mind. I educate them on the benefits of my product, and then I guide them in the buying decision process. Sure, sometimes I have to exert more guidance with some prospects than others. With some, my sales presentation runs with clockwork precision as if both the buyer and I were following a script. Then, with others, people require more motivation to make a buying decision. They want to buy but get the jitters about parting with their money. If I were to allow these sales presentations to get out of control and lack direction, I would be negligent in my job. If customers floundered and remained indecisive, I would feel as though I had performed a disservice to them. While I refer to it as a good teacher/pupil relationship, you may also view it in the same vein as the relationship that a good parent or clergyperson establishes. It’s a role of authority, which when properly sustained, fosters respect and admiration. This is a status that few salespeople ever attain, and one, I believe, that represents a standard that all should seek. Too many salespeople think they can control the sale by not allowing the prospect to get a word in edgewise. This school of thought actually believes sales are made by out talking the other guy. I completely disagree for three reasons: First, questions are asked to get the necessary answers to find out what the prospect’s needs are. Second, questions are a sign of sincerity, expressing a desire to help the prospect. Third, when questions are properly asked, they do, in fact help maintain control of the sales interview. I don’t care what product you sell—automobiles, computers, houses, insurance—you have to ask a lot of questions to find out what the prospect’s needs are, otherwise, you’ll end up working in the dark. It by no means indicates that you’re giving up control by allowing the other person to speak. It should always be a two way conversation, and it’s your responsibility to make the prospect feel comfortable participating in it. Listening is a vital part of selling. When a fact-finding session is properly executed, you elevate yourself to a professional level considerably higher than most run-of-the-mill salespeople. You become an authoritative figure and position yourself in a consulting role rather than a selling one. By doing so you gain control of the sale!